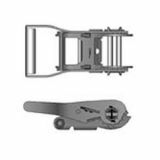 Replacement ratchet style winch used with PVB-1350, OCV-900 and similar net systems. Leader strap purchased separately. 3-1/2" O.D. Brass cover plate and anchor work independently to allow for installation into floating wood floors. 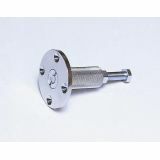 Anchor cylinder width is 1-1/2". Billet steel body gives 9000 lb pullout strength intended for all floor applications except floating wood floors. 3-1/4" chrome cover. 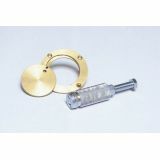 Center is 1/2" - 13 thread with spring loaded closure plug. 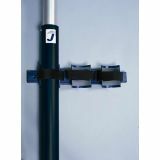 Heavy duty steel rack attaches to wall and holds 3 posts in upright position for easy storage. 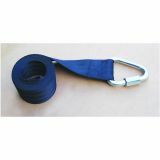 Replacement leader strap for ratchet style winch. Winch purchased separately.